For months, investors have talked about how crowdfunding is changing the hardware investing landscape. The theory goes that the advent of Kickstarter and Indiegogo allow companies to test product-market-fit in a notoriously challenging category. And the numbers suggest there may be something to this: Venture investing in hardware companies increased 233 percent from 2007 to 2013 according to CrunchBase. Anecdotally, there’s another corollary trend in how investors are backing hardware companies. It goes something like this: hardware company raises a seed round; hardware company launches a crowdfunding campaign; hardware company raises more money; the amount of which is directly based on the crowdfunding success. That’s how things felt at least but the trend was 100 percent anecdotal — apart from feeling like it was real, I had no data to back it up. To put the theory to the test, it became time to crunch some numbers. Gathering data for this exercise required both public crowdfunding results and public fundraising results. This meant the scope of the exercise was limited to Kickstarter and Indiegogo for the crowdfunding side and to CrunchBase and Mattermark data for the investment side. Results were collected from the start of both crowdfunding platforms through November 21 and only included campaigns that raised more than $100,000 in crowdfunding. Under those parameters, a total of 91 projects that raised $77 million in crowdfunding went on to raise $511 million in venture funding. Seventy percent of those companies raised money from investors before turning to the crowd. The first thing to try was to examine the relationship between crowdfunded dollars collected and venture dollars raised. At the high level, there was moderate coloration between the two (r=0.34) but it was not particularly strong. That felt directionally correct but not to the level anticipated. Peeling back the onion a bit further, the next step was to break the crowdfunding levels into buckets to help better examine the relationship between success on Kickstarter/Indiegogo and venture appetite. Turns out by doing this the story changes. Breaking the crowdfunding success into five buckets, a pattern starts to form. A company’s crowdfunding success seems to be related to its ability to raise venture money. All buckets start with similar amounts of investor money up front: around $1-3 million of seed funding, with the smaller campaigns raising less venture money up front. Next comes the campaign where things get a bit more binary. Raise less than $750,000 in a campaign and raise around $2 million in venture funding. Raise more than $750,000 in a campaign and raise around $7 million in venture funding. What’s the take away here? 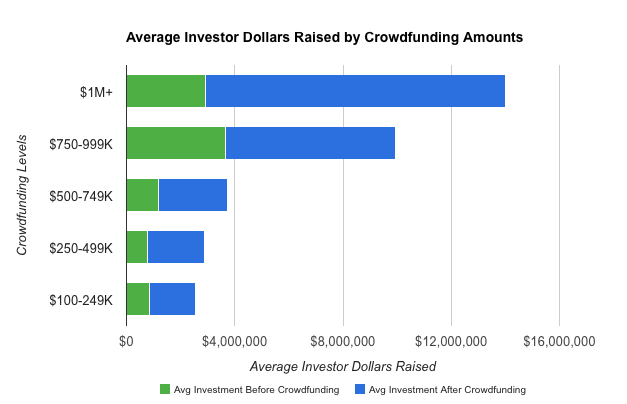 If you are a hardware entrepreneur looking to raise venture money, the data suggests that how you do on your crowdfunding campaign matters to investors. Your goal? For a smooth path to raising meaningful dollars post campaign, aim to break $750,000 or more in crowdfunding. Investors will thank you for it. All data used in this post is shared on Google Drive.